New York: The Textile Museum of Canada presents its exhibit “Shine” this summer. Curated by Natalia Nekrassova and Sarah Quinton, this exhibition promises to be a visual delight. It takes its audiences on a cultural journey through the lenses of the varied and highly representative textile industries across Asia. The exhibition thus represents human ingenuity over a period of 200 years. 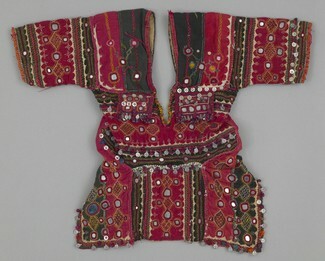 Primarily consisting of handmade objects that are celebratory and commonplace, it features an expansive array of textile artists from India, Pakistan, Afghanistan, Syria, South East Asia, China and Japan, reflecting on their respective cultures and contrasting perspectives on the ideologies of style and status. Objects on display are an elaborate mix of pieces from the museum’s permanent collection, and the works of contemporary artists such as Carmelo Arnoldin, Ghost of a Dream, Rhonda Weppler and Trevor Mahovsky. Viewing works from the past and present in the same space, creates an interesting dialogue between the works, not only cross culturally, but also traditionally. It is thus an interesting juxtaposition, where one can clearly understand the conflicting and complex ideologies of desire, wealth, status and beauty among different kinds of people. A blouse, tracing back to mid 20th century Karnataka, in South India. The garment is said to have belonged to the Banjara people/tribe, earlier known to be baggage carriers of the Mughal armies in the 17th century. They now live simple lives in rural India. 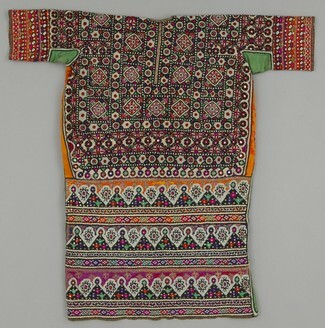 The blouse displays the fantastic workmanship and the rich traditions of the Banajra people in India. Another garment on display is this beautiful and intricately designed wedding blouse, dating back to mid 20th century Sindh in Pakistan. The local name given to this piece of garment is “chola”. It is reflective of the rich textile skills and culture of the Lohana community in Sindh. Chola’s are the most spectacular with rich embroidery and ornamental finish. It is to be worn by a bride in addition to trousers and a long veil. 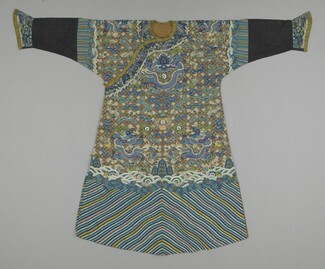 Below we see an intricately designed silk robe, tracing its roots to 19th century China, locally called ‘Jifu’. The exhibition is accompanied with various informational seminars, lecture sessions and guided tours. In an effort to keep audiences engaged and to provide an opportunity to participate in interesting conversations with the curator and specialists involved. The Textile Museum of Canada, based in Toronto, is one of the most engaging visual art organizations of its kind. With a private collection of more than 12.000 objects across over 200 countries, it curates captivating exhibitions that are culturally diverse and unique.